A validation caused records to be skipped during a previous restore. The validation rule was then disabled and the records should now be restored. Records were previously restored but the data in the CopyStorm backup has changed. Previously restore Salesforce data should be overwritten. 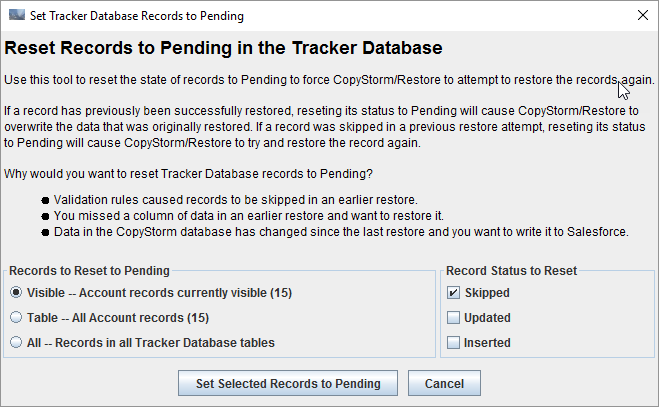 Records in Salesforce were deleted by hand and should be re-restored without losing the tracker history. Choose which records to reset to pending. Choose which record statuses can be affected. Default parameters will change all visible skipped records to a pending state.